The Honda Accord is one of those cars you can pretty much buy without worrying about it. Ah, the Honda Accord – one of the true safe havens of the second hand world. Safe, reliable, comfy and long-lived, the Accord is one of those cars you can pretty much buy without worrying about it. As long as the previous owner has looked after it reasonably well, you’ll have little, if any, bother. This generation of Accord was something of a move upmarket for Honda. The previous model had been shared with the old Rover 600 (remember that? ), but the 2003 car was actually based on an American-market Acura, so interior quality took a big step up. The interior looks perhaps a touch dated now, but at the time it was favourably compared to those from Lexus and Mercedes-Benz. At first, this Accord was launched with a choice of 2.0-litre, 150hp VTEC petrol four-cylinder engine, or a 2.4-litre 190hp version in sporty Type-S trim. Hardly surprisingly, given the juicy tax bill for a 2.4-litre engine at the time, you’ll struggle to find a 2.4, but that’s no real hardship – the 2.0-litre is a classic high-revving Honda engine, exceptionally smooth, with that extra VTEC kick as the revs pass 5,000rpm. Better yet, this was the first generation of Accord that could be had as a diesel. 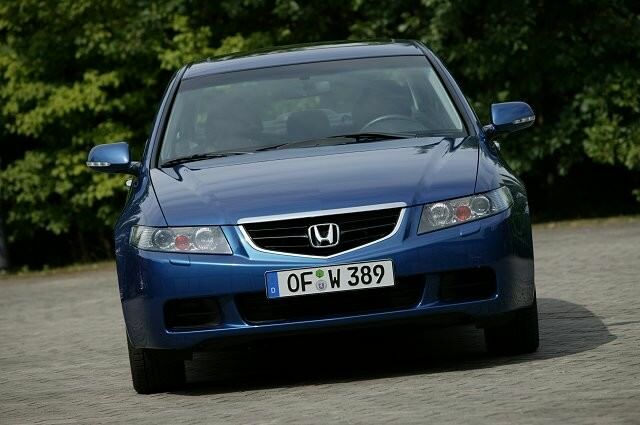 In fact, the Accord was the first vehicle ever to use Honda’s ‘Whisper Diesel’ 2.2- i-CDTi engine that set new standards for refinement and smoothness in its class. Again, since then, newer engines have overtaken it in that department, but it was quite the thing at the time. Even now you should easily be able to crack 45mpg with it in daily driving, and it has a lovely seam of low-down torque – 340Nm of it. There was also an estate version, which adds a good deal of practicality to the Accord (which in saloon form was always a little short on boot space), but the unlovely styling (it’s a bit hearse-like) and the general Irish ambivalence towards estates means you’ll struggle to find one now. Of course, as with all Hondas, reliability is an Accord strong suit, but with the oldest cars now teenagers, you still need to check them over carefully. The 2.0-litre VTEC petrol engine can chew its alternator, and replacements can be expensive, for example. All Accords have a delicate double-wishbone front suspension setup that is sensitive to damage and which will give itself away in uneven tyre wear. The cabins, although well screwed together, can also wear quite badly, although a good valet can often restore much of their original shine. The 2.2 diesel also had an occasional habit of developing dual-mass flywheel trouble, although Honda Ireland has assured us that this is not a common issue. Of course, one issue is that people assume that Accords are hugely reliable and so end up not properly looking after them, so make sure your car comes with a proper service history, while the automatic option on the 2.0-litre petrol is to be avoided – owners have complained that it seriously kills the car’s acceleration when overtaking. If you can find a last-gasp 2.2 i-CDTi, preferably an estate for added practicality, from 2008 or 2009, you’ll have a car with lots of life left in it, but also one with a much reduced tax bill thanks to the diesel’s 143g/km emissions. Still smart after all these years, the Accord makes eminent sense as a used buy. Reliable and good to drive, just make sure yours has been properly looked after.